Tattoos have been around for centuries, originally spawning from ancient traditions and gradually becoming a mainstream practice for many people today. However, a tattoo is more than an image: for many, it’s a special symbol that brings meaning to everyday life, a way to reflect a piece of themselves to the outside world. With such significance riding on the tattoo you choose, finding the right tattoo parlor isn’t a decision to take lightly. Your skin is in good hands at one of these 10 best tattoo parlors in South Carolina. This award-winning tattoo parlor has gained a wide reputation for being the best in the area. The artists here work with you to help you choose the design that reflects the statement you want to make, even if it’s simply fixing or touching up an existing tattoo. Prices start at $50. If you’re new to tattoos and want the best experience, there’s no better place to go than Cherry Bomb. The people here are as friendly as they come, and can help put you at ease and give you the best possible experience. If you’ve already got a few tattoos, you’ll wish you would have come here first. 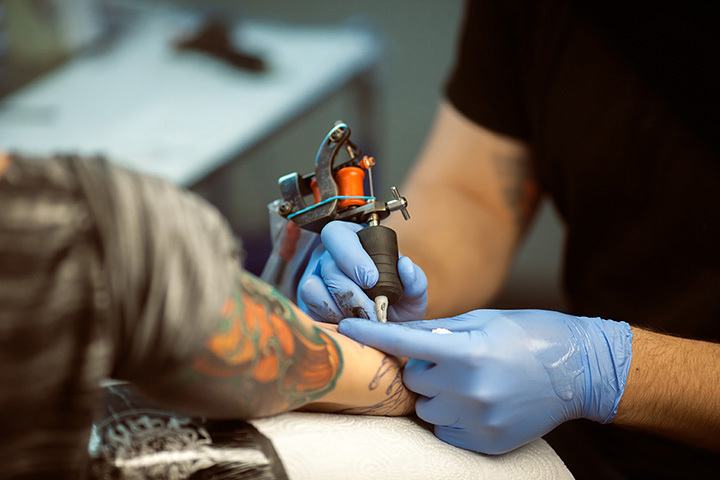 Hosting some of the best tattoo artists of the Grand Strand, this highly acclaimed tattoo parlor prides itself on its high-quality artwork and clean, comfortable environment. Best of all, they’re open every day of the week. Specializing in custom work and touchups, fans love Siren’s Cove Tattoo because they know what they can expect every time they visit. The work is always high quality and consistent, and makes a good choice for first timers who need a little guidance on their first tattoo journey. The artists here listen to what you want and ask questions to make sure they can deliver on your results. If you aren’t sure what design you want or where you want it, consult with the experts at 123 East Coast Ink. They can help you choose the perfect tattoo and placement to give you the best experience. The artists here are true professionals who care about their craft and love sharing their passion with others. Whether this is your first or fifth or 50th tattoo, you’ll be glad you came here. Their fans rate them as the highest in the area because of their dedication to quality, safety, and service. Their mission is to provide you a tattoo that will last a lifetime, and their hundreds of satisfied customers agree they’re worth a visit. You can check out their in-store sample pages or bring in your own design to get exactly what you want. Having been in business for a decade, 8 Sins Tattoo is doing it right. Fans love how comfortable the shop is and how it puts them at ease before hopping into the chair. The artists here are talented and steady-handed, and know how to make all the fine details pop. Your visit here doesn’t end once your tattoo is finished. The team here is dedicated to helping you care for your tattoo long after you leave the shop, and can help you get the most from your experience. The artists here take their work very seriously, and it shows in every tattoo they create. This tattoo parlor/lounge delivers the best experience both before, during, and after your time in the chair. While you’re waiting on your artist, you can play a round of pool or lounge on the comfy furniture. The artists here are extremely skilled in detailed tattoos, and want to make sure you exactly what you came for, but better than you ever thought possible. Fans of Imperial Ink agree that the work and customer service here is nothing short of spectacular. This tattoo shop takes care to answer your questions and ensure you know how to care for your tattoo after you leave their shop. The artists work with you to ensure you get the tattoo of your dreams, and will make sure you are satisfied with your design.